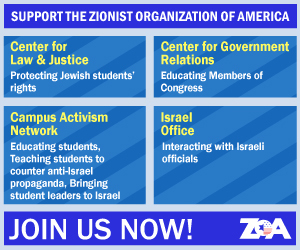 Zionist Organization of America (ZOA) has praised Brazilian President Jair Bolsonaro’s announcement that Brazil will be opening a trade office in Jerusalem. President Bolsonaro and the Brazilian Foreign Ministry made the announcement during President Bolsonaro’s visit to Israel over the weekend. 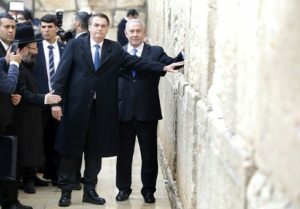 On Monday, President Bolsonaro, accompanied by Prime Minister Benjamin Netanyahu, paid a visit to the Western Wall in Jerusalem’s Old City, their first time a foreign leader and head of state has visited the western Wall in the company of the Israeli Prime Minister. President Bolsonaro, prior to his election as president, promised to recognize Jerusalem as Israel’s capital and relocate the Brazilian Embassy from Tel Aviv to Jerusalem but has for the moment opted for the more modest move of opening a trade office in Jerusalem. The Brazil Foreign Ministry said that “Brazil decided to create an office in Jerusalem to promote trade, investment, technology and innovation as a part of its embassy in Israel,” while President Bolsonaro said at a joint press conference with Prime Minister Netanyahu that “the wedding [between our two countries that] we are celebrating today is going to bring many benefits to both our peoples” (Daniel Uria, ‘Brazil to open diplomatic office in Jerusalem,’ United Press International, March 31, 2019). However, at the same time, Brazilian presidential spokesman Otavio Rego Barros said that, “There is no recognition of Jerusalem as the capital … Our president continues to evaluate this possibility (of moving the embassy), but that is not what we decided at this time.” Although Brazil noted that the new trade office is not a diplomatic office, the move was still harshly criticized by Mahmoud Abbas’ Palestinian Authority (PA), which was additionally angered by President Bolsonaro’s failure to visit the PA as well as to coordinate his visit with the PA (‘Brazilian President Visits Western Wall, Palestinians Angry Over Jerusalem Mission,’ The Algemeiner, April 1, 2019). ZOA National President Morton A. Klein and Chairman Mark Levenson, Esq., said, “The ZOA applauds Brazilian President Bolsonaro for opening a trade office in Jerusalem as part of the country’s existing embassy, which remains located in Tel Aviv. “Although we are disappointed that initial expectations of Brazil relocating its embassy to Jerusalem, based on President Bolsonaro’s past statements, has not as yet been realized, we are nonetheless pleased that the new Brazilian trade office will be located in the same city as Israel’s seat of government. “This is especially so, in view of the tremendous pressure Mahmoud Abbas’ PA and other Arab governments have reportedly been placing on Brasilia to avoid any enhancement of Jerusalem’s status as Israel’s capital through opening a Brazilian government offices there. “Mahmoud Abbas’ PA is opposed to anything that rolls back its ambition to see Israel isolated and ostracized as a prelude to its event elimination. The Brazilian government’s decision to establish a trade office in Jerusalem represents a flat reversal of its desires. “It is, therefore, no surprise that the PA ambassador to Brazil, Alzeben Ibrahim –– who, in 2011, stated that “Israel should disappear” –– has been so outspoken about the Brazilian decision, which he says may yet result in the PA recalling him from Brasilia.